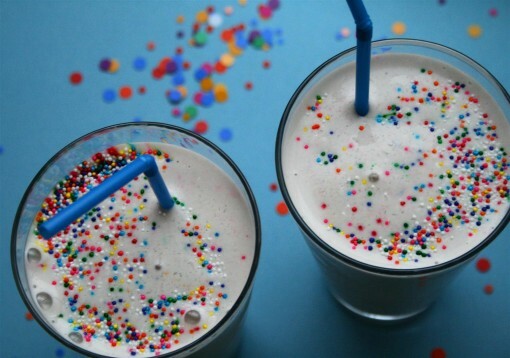 Birthday Cake Milkshake was posted on March 20th, 2012 and is filed under Desserts, Drinks & Smoothies, Kid Friendly, Protein, Recipes. This entry has 41 comments. You can follow any responses through the RSS 2.0 Comment Feed. Today is the first day of spring! However, our home is covered in inches of snow. For the entire winter we’ve had barely any snow and right when we’re supposed to start the whole “green grass and daffodils” thing we get a snowstorm! I had planned on playing some outdoor volleyball for my birthday party (which I played only a few days ago! ), but now that looks like a really silly idea. Maybe snow volleyball could become a sport, but I’d probably be the only one willing to play it. And yes, it’s also my birthday today.Which is why I’m sharing this extremely delicious and decadent treat with you! I’ve wanted to make this for a long time, but traditionally it’s made with ice-cream or frozen yogurt. 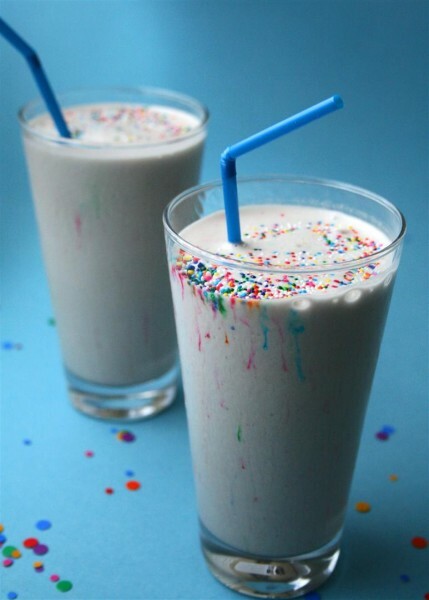 The healthy versions I’ve seen posted on the Internet include frozen bananas or coconut oil, and although tasty, to me, they just don’t taste like the REAL Cake Batter Milkshake. That being so, I wanted to make it with a healthy twist while still tasting the way it’s supposed to. This serves 2-3. We had this for a siblings movie night and I actually put it in the freezer for a couple hours beforehand. It was amaaaazing and tasted like “Birthday Cake” ice-cream. Just something you might want to try! Note: The protein powder can be optional, but I like adding extra protein to my shakes. 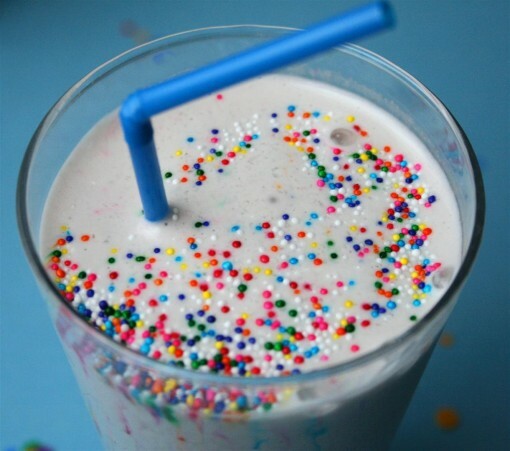 It also gives the shake an even more creamy, vanilla flavour! Although this is a pretty healthy twist for this smoothie…you might want to check out this healthy chocolate cake batter smoothie I featured on my site! The sprinkles made this such fun! I love the way the sprinkles make rainbows…so pretty! You might be wondering how the Birthday Challenge went? Well, my goals were almost all completed! I got up earlier almost every morning (Score! ), working out before studying was not as successful (however, I still worked out later on), and I lost over my goal of 3 lbs. It was so fun to find out, through FitFluential, that a fellow ambassador had the same birthday as me, so she decided to do the challenge too! Thank you guys for reading and for being such a sweet blessing in my life…each one of you make my day with every comment, conversation on Twitter, and email you send. Hope your day is as awesome as you are! Is your birthday in the spring, summer, fall, or winter? this weather is all kinda funky, it’s going to be 72 in NYC today! I almost wore a dress! This looks delicious! 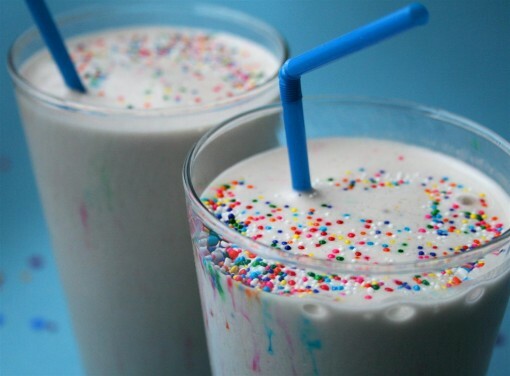 Never thought of putting cake batter in a milkshake. but it looks thick and rich. delicious! Happy Birthday, Charissa! Aw, the sprinkles look so pretty! Happy birthday!! Happy Birthday! (a little belated :)) I think you celebrated in just the right way…this shake looks absolutely delicious!! Happy birthday! I hope warm weather comes quickly to you! Holy crap! First, HAPPY BIRTHDAY!!! Have a great day, Charissa!! I must say, it’s quite refreshing not to see that ubiquitous pastel and white striped straw in your delicious looking milkshake! Those darn straws are everywhere! Congrats on shaking it up. Happy Birthday! I would love to use my colorful straws for this…Perfect! Love this! So festive and healthy!! I bet it super yummy too! Cake mix in a shake? MIND = BLOWN. And happy birthday!! 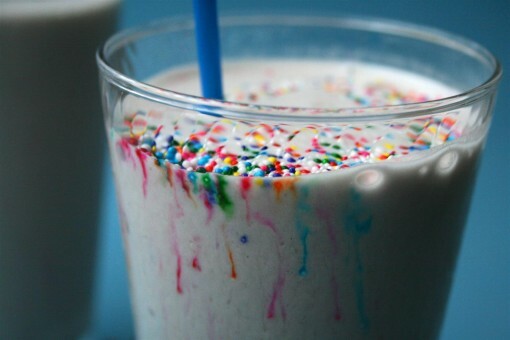 I always prefer ice cream over cake, so instead of cake for any bday, I’ll be making a bday cake milkshake. What a brilliant idea! Happy Birthday!! These look so yummy!! Yum, just made it but added a banana to it. How many cals is this? This milkshake looks really yummy. Thanks for sharing! Andrea~ So glad you liked it…I didn’t put the calorie count/nutritional info on this because every cake mix and protein powder is different…you can log your recipe in at this recipe analysis link: http://caloriecount.about.com/cc/account/flog_add.php?tab=new_recipe Hope that helps! Can the almond milk be chocolate?? Dominique – You could! However, I’d probably use an organic chocolate cake mix instead if birthday cake. Let me know how it goes! My son and I both love this one and will be making it again soon.